Mitchison's compelling first novel, The Conquered, covers the years of Julius Caesar's Gallic War and its aftermath. Its theme is the complex, ambivalent relationship between victor and vanquished. 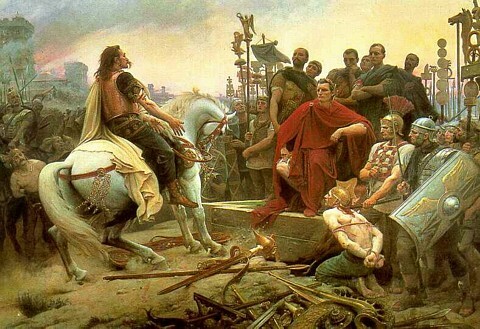 By 57 BC it is clear to the Gauls that by asking the Romans for aid against their old enemies the Germans, they had unwittingly invited the fox into the henhouse in the form of ambitious Roman general Julius Caesar. Fearing annexation, the Veneti, a seafaring tribe from coastal Brittany, capture several Roman officers as hostages: insurance, they hope, against Roman aggression. One such captive is Titus Veturius Barrus, imprisoned in the household of Veneti chieftain Kormiac the Wolf. There Titus encounters the chieftain's son, Meromic, with whom his life will become inextricably entangled. Caesar's response to the Veneti is swift and brutal. Following their defeat Meromic is sent as a slave to Rome, where he is cruelly treated. While at home on leave Titus recognises and rescues Meromic, who becomes not just his slave, but his liege-man and companion throughout the doomed campaign of Gallic king Vercingetorix against Caesar's forces. Although bonds of love and gratitude tie Meromic to his rescuer, these conflict with his loyalty to the Gallic cause. Repeatedly, he runs away to join his fellow Gauls, but is always drawn back to Titus, who never truly understands Meromic's bitter desperation. No matter how settled Meromic eventually seems in the role of Titus's devoted retainer, at heart he remains a caged wolf. In her memoirs, the remarkable Mitchison wryly commented, “It's always a bore being ahead of one's time.” She could well empathize with the plight of those tied to a society but alienated from it in spirit, a recurrent theme in her work. See the Wikipedia entry on Naomi Mitchison for more about her life.